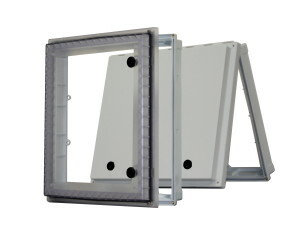 The IPW AR 1614KF is a UL listed, NEMA rated non metallic polycarbonate HMI cover enclosure with cylinder key locks. The IPW AR 1614KF includes the following: Opaque hinged cover base with an opaque flat cover with formed in place PUR gasket. one stainless steel hinge pin and 12 stainless screws and template for underlying mounting. The IPW 1614 can easily be customized with cut outs, holes, or recess, in our warehouse and custom labeled or printed before shipping. Contact Fibox for more information, or a free quote.